Overview - Oscar-winning cinematographer Jack Cardiff had a career that spanned nine decades of moving pictures, providing a number of timeless classics such as "The African Queen" and "The Red Shoes." Through his pioneering use of Technicolor photography, his work behind the camera altered the look of films permanently. An obsessed ballerina chasing perfection across surreal stages of radiating color. A surly boat captain and a determined missionary journeying down a dangerous African river toward adventure and peril. An emotionally unraveling nun who gives way to her primal passions amidst the boundless backdrop of the Himalayas. These are all immortal images from the silver screen that have been cemented into the very consciousness of cinema, influencing countless filmmakers over the years -- and, they are all images that were shot by the creative and visionary eye of one legendary cinematographer, Jack Cardiff. One of the true greats of the art form, Cardiff helped to pioneer Technicolor photography and left an indelible impression on the world of motion pictures. 'Cameraman: The Life & Work of Jack Cardiff' traces the cinematographer's personal journey and career, as told through wonderful clips from his films, interviews with his collaborators, and entertaining stories from the man himself, shining a sparkling light on the golden age of moviemaking. The documentary starts off with archive footage of actor Dustin Hoffman bestowing Cardiff with an honorary Academy Award, and from here the film cuts between various talking head interviews, stills, film excerpts, and one-on-one sessions with the DP, that all work to form a comprehensive and enlightening portrait of the man's many cinematic contributions. Cardiff's early life is touched upon and then the focus quickly shifts to his film career, detailing how he worked up the ladder from assistant all the way to director of photography. His most celebrated films are all covered in great detail with extended clips, ranging from his beloved Powell and Pressburger collaborations, 'A Matter of Life and Death,' 'The Red Shoes,' and 'Black Narcissus,' to his works with Alfred Hitchcock, John Huston, Richard Fleischer, and even Sylvester Stallone. Interviews with film historians, admirers, and colleagues such as Martin Scorsese, Kirk Douglas, Thelma Shoonmaker, and Charlton Heston, are all included, helping to illuminate the man's great, lasting impact, both professionally and personally. Of course the most interesting material comes from Cardiff himself, and the famed cinematographer shares some great anecdotes about his work in classic cinema. Bits of production trivia are given on many of his films, and Cardiff details some great behind-the-scenes stories about the various legendary performers and directors he's worked with, including John Wayne, Errol Flynn, Orson Welles, Marlene Dietrich, Ava Gardener, and Marilyn Monroe. In fact, one of the most enticing aspects of the documentary comes in the form of Cardiff's working relationship with his various leading ladies. Over the years he's taken several fantastic portraits of the many gorgeous stars he's filmed, and his stories about each one help to reveal the intricacies of the all important cinematographer/actress bond. In many ways, it was Cardiff's job to make these women look extraordinary, to find a way to highlight their otherworldly beauty in a manner that only cinema can, and the experiences he shares about developing a trust between each actress is quite fascinating. Along with numerous anecdotes, Cardiff also shares some of his personal behind-the-scenes footage from the sets that he worked on, providing an intimate and rare peek into his career and moviemaking in general, both during and in between takes. While the film does a great job of tracing Cardiff's filmography and legacy, there are times when it slightly loses focus. The sections that deal with Cardiff's collaborations with Powell and Pressburger, for example, veer the spotlight too much toward the famed filmmaking duo, and Cardiff's specific contributions are slightly glossed over. Also, though the documentary does a decent job of revealing some personal details about Jack's work, for the most part, it rarely goes beyond his professional life. We get some great stories about classic films and stars, but to a certain degree, Cardiff himself remains at a distance. While a great surface examination of the cameraman's life and legacy, there are times when I wish it delved a bit deeper. 'Cameraman: The Life & Work of Jack Cardiff' is an interesting and entertaining look at the celebrated cinematographer's legendary filmography. While the focus tends to favor the work more than the man himself, we do indeed get a peek into his life and personality, mostly through the stories that he himself shares. Filled with beautiful footage and fascinating trivia, the documentary spotlights a sometimes unsung profession. Director's may technically have the vision, but it's men like Jack Cardiff who actually bring those ideas to the screen, and the world of cinema, and audiences all around the globe, shall remain eternally grateful. 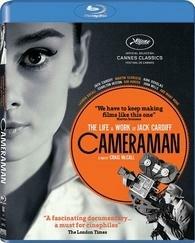 Strand Releasing brings 'Cameraman: The Life & Work of Jack Cardiff' to Blu-ray on a single BD-50 disc. My screener copy did not come in final retail packaging, so I can't speak to the box itself, though I would assume it comes housed in a standard Blu-ray case. After some warnings and logos, the disc transitions to a standard menu. The movie is provided with a 1080p/AVC MPEG-2 transfer in the 1.78:1 aspect ratio. Featuring footage from a variety of sources, quality wavers throughout but is mostly pleasing. Interview footage appears to come from various film and digital mediums, and while some sources look better than others, they all feature nice clarity (and fine grain on the film material). There are some specks on the film footage but there aren’t any major signs of damage. Several of the interviews were actually conducted in very professional studio setups with impressive lighting designs, and these of course look the best and add a welcomed level of production value to the proceedings. Various clips from Cardiff's movies are included throughout, and again, come from different sources. Most of the excerpts appear to be pulled from fairly low quality standard def masters and are thus upscaled with some noticeable artifacts like edge enhancement. A few films ('The African Queen,' 'The Red Shoes,' and 'Black Narcissus') look like they were taken from actual high definition sources and look great, with nice saturation and clarity. Overall colors, contrast, and black levels are all dependent on the source of the footage and shooting conditions of the interviews being showcased, varying from good to a little washed out or overexposed. Since the material comes from many different mediums, the look of the documentary is fairly inconsistent. With that said, it's always watchable, and more often than not, quite pleasing. Even though some of the upconverted footage isn't all that impressive, this is still a nice looking documentary and Cardiff's work shines though in any condition. The movie is presented with an English Dolby Digital 5.1 and 2.0 track, with no subtitle options. The mix is pretty front heavy and basic, but it gets the job done in a clear and fitting manner. Dialogue from the interview footage is clean and all of the participants are easy to make out. Some of the archive footage and film clips do feature a thin quality with some minor technical quirks, but that's understandable. There is some nice separation in the actual music used, but for the most part, directionality is pretty sparse. Surround effects are minimal, but there are a few occasions when audience applause and reactions boom from the rear speakers. Dynamic range is decent and there is no distortion among the frequencies. Bass is subdued but that is to be expected considering the subject matter. Balance between all of the audio elements is handled well, and the various interviews, film clips, and archive material are all mixed together appropriately. Like the video, the audio does vary a bit depending on the source, but sounds just fine. While front heavy, lossy, and not terribly immersive, there is some nice fidelity in the score and all of the interview material comes through cleanly. Strand Releasing has put together a nice but brief collection of supplements, including an interview with the director and extended material from the documentary. All of the special features are presented in 1080p with Dolby Digital 2.0 sound. Interview with Craig McCall by Ian Christie (HD, 13 min) - This is a nice and informative interview with the director of the documentary. McCall provides background details on how he first got to know Jack Cardiff and on what made him decide to make the film. He also touches on the long production time (about thirteen years). This documentary really seems like a huge labor of love for the filmmaker, and his passion shines through in the discussion. McCall's insights into Cardiff and the directing process are all interesting and this is definitely a worthwhile inclusion. Jack's Actress Portraits (HD, 4 min) - Extended footage of Cardiff sharing his actress portraits is included, with more brief stories about Monroe, Loren and others that are certainly worth a look. Jack's Behind the Scenes Movies (HD, 10 min) - This is more footage of Jack's personal behind-the-scenes movies taken on his various film sets, along with comments from the man himself. The brunt of the material is from 'The African Queen,' and Cardiff shares more fun production stories about the making of the film. Cinematographer and Director Relationship (HD, 12 min) - Extended interviews from the documentary are included that feature the various participants discussing the intricacies of the cinematographer/director relationship. Working with Three-Strip Technicolor (HD, 5 min) - Here we get more interview footage with various participants (including Cardiff) providing information about the Technicolor process and what it was like to work with the company in its early days. Photo Galleries - Separate photo galleries are included for Actress Photos and Production Stills, featuring Cardiff's actress portraits and some behind-the-scenes stills from the making of the doc and Cardiff's previous films. Original Theatrical Trailer (HD, 2 min) - The movie's theatrical trailer is included. Other Strand Releasing Trailers - More trailers for other Strand Releasing titles are included. 'Cameraman: The Life & Work of Jack Cardiff' is an entertaining and insightful peek into the famed cinematographer's treasured filmography. Though the documentary doesn’t go quite deep enough into the man himself, the stories that Cardiff, his friends, and admirers all share are more than worthwhile. Video and audio quality varies depending on the source of the footage and recordings, but the majority of the material looks and sounds just fine. Supplements are a bit brief but interesting. This is a nice disc for a very solid documentary that definitely comes recommended, especially for fans of classic cinema.